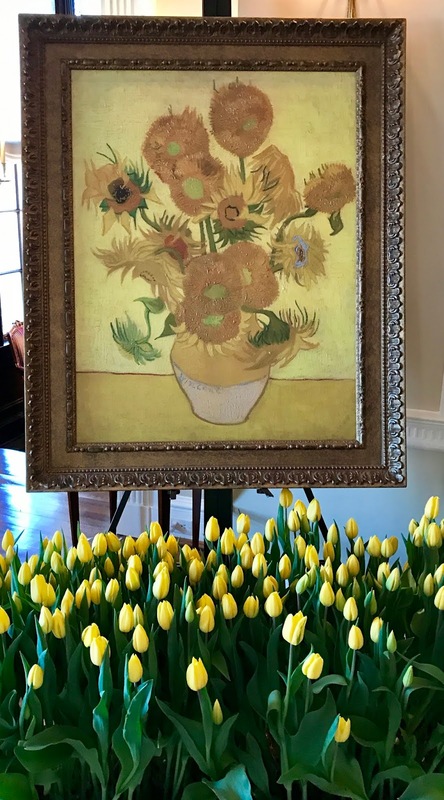 While we waited for the cherry blossoms to bloom, a flood of intense spring color arrived in DC’s Kalorama neighborhood when 15,000 tulips filled the residence of the Dutch Ambassador for #DutchTulipDays. Ambassador Henne Schuwer has an enviably direct pipeline to tulips; his home country is the second biggest agricultural exporter in the world, and that includes the 450 million tulip bulbs sent to the U.S. each year. 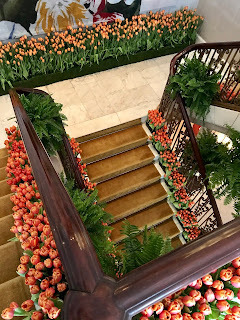 This week his official residence was a floral showcase for Tulip Days, to celebrate the horticultural ties between the Netherlands and the U.S. After an early morning press preview, the Ambassador hosted a series of diplomatic lunches and receptions. Fifteen thousand tulips certainly made a start in recreating that floral experience. 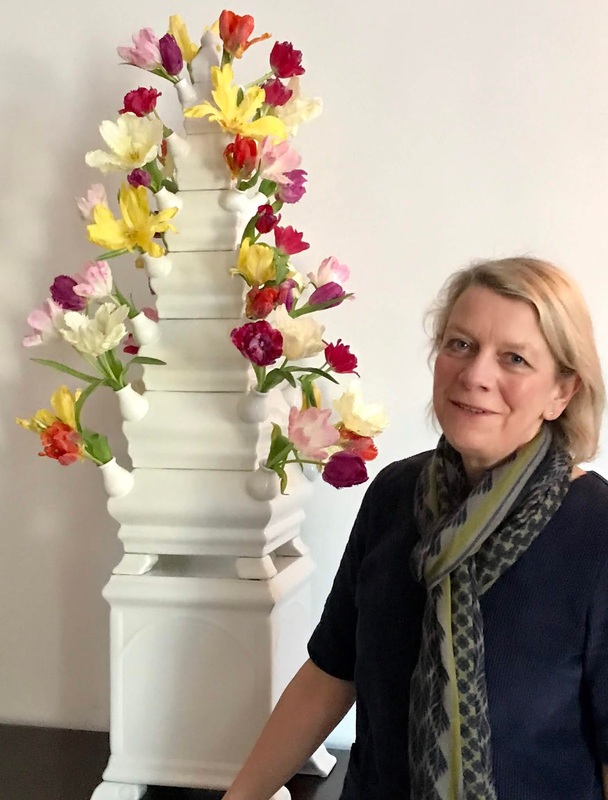 The design expertise behind the modern and traditional arrangements came from florist Susanne Schrijvers, based in France and the DC-area. Schrijvers banked the imposing staircase in orange blooms, the Dutch national color, packed closely in rectangular containers. Simple modern displays around the edges of rooms included groups of metal buckets with bunches of multi-colored cut tulips, or windowsills lined with glass cylinders of water holding blooming tulips — stems, bulbs, roots, and all. Console tables beneath Old Master paintings featured airy arrangements of tulips especially grown in France for their long stems, combined with branches of cherry blossoms. Each round table in the dining room was centered with a silver bowl containing just one variety of tulip, with no repeated colors from table to table. The dining room and library fireplaces had “flaming” mixtures of tall red and yellow tulips. An unusual container was the 17th-century-style tulipiere, a tower from the days of Tulipomania, created to spotlight the wildly expensive tulips of that era. The living room stars were two Van Gogh reproductions, loaned by the Van Gogh Museum in Amsterdam, with harmonizing tulip tributes at their feet. Schrijvers wanted a knockout display, to honor the culmination of the Ambassador’s service in Washington. She not only increased the number of tulips over past years, but added living walls of tropical plants in the library, and out-sized Boston ferns in the stairwell. You can see many more photos from the Tulip Days event at the Washington Gardener Facebook page. Charlotte Germane recently jumped the Potomac from the American Horticultural Society to Georgetown's Tudor Place, an historic house museum and garden. She spent four years as the first Digital Communications Manager at the AHS, following three crunchy years in communications and public relations for the largest organic gardening supply company in the U.S.